Okay, now here's a concept that may not seem like a big deal but in a lot of ways it IS a big deal. Why? Well, in Algebra, one of the 'big' ideas is that you are always factoring polynomials. 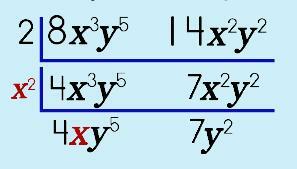 If you don't know how to factor a MONOmial, then how in the heck can you possibly factor POLYnomials and quadratics? 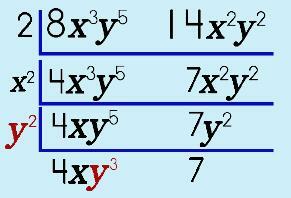 Finding the factors of monomials is a basic, foundational skill. It goes WAY back to what you learned in elementary school…and the days of the 'greatest common factor' and 'greatest common divisor.' Let's see how you can put that old knowledge to use in Algebra! and, you wanted to find out what the Greatest Common Factor they share is. What would be the best or easiest method for finding it? Check this out! Step 1: Write out the monomials side-by-side. 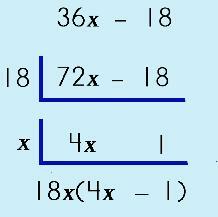 Write the monomials side-by-side, horizontally. Then, draw an upside-down division 'house' as shown. Step 2: Look at the COEFFICIENTS. Starting with the coefficients, see if you can find a common factor/divisor. IF they share a common factor/divisor, then use it! Write this number on the outside of the 'house,' as shown. Write the dividend below. Step 3: Look at the first common variable. Next, look at the first common variable. Write this variable on the outside of the 'house,' as shown. Factor it, including the number of EXPONENTS (remember to use the exponent rules!). Step 4: Continue factoring the variables. Each variable/step has its own floor on the house! Continue looking for COMMON VARIABLES. Factor them out. Make a new 'house' each time. This way, you won't make an error! *Each new step should have add a new floor to the house! The Greatest Common Factor (or Greatest Common Divisor) is now easy to find. Look along the LEFT side of the house. Multiply each of these terms together. This is your GCF or GCD (some textbooks call it the GCF and others call it the GCD. Step 6: Put it ALL together now! 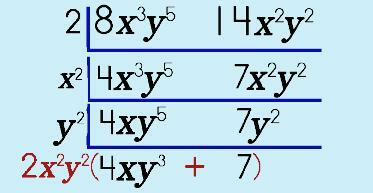 wrap up the rest of the factors in a set of parenthesis, being careful to put the operation symbol BACK in, and voila! You are finished! When you factor a polynomial you are finding the factors, which are not just numbers but numbers AND variables, that are common to each term in the polynomial. The common factors do not 'disappear' once you factor them out either…because they 'reappear' outside of a set of parentheses! Basically, you are re-arranging terms. An important thing to remember is that when you factor and 'nothing' is left, there is NEVER 'nothing' left! Why is this? 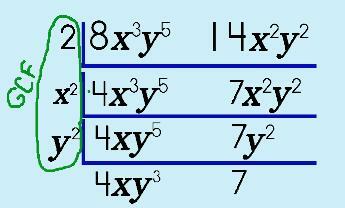 (stop and think about this for a second…) We are talking about multiplicationa and division, right? If we put down a 0 (zero), then what does this mean? Uh oh...it doesn't work. So, if 'nothing' is left, then always put down a 1 (one). See the example to the right.